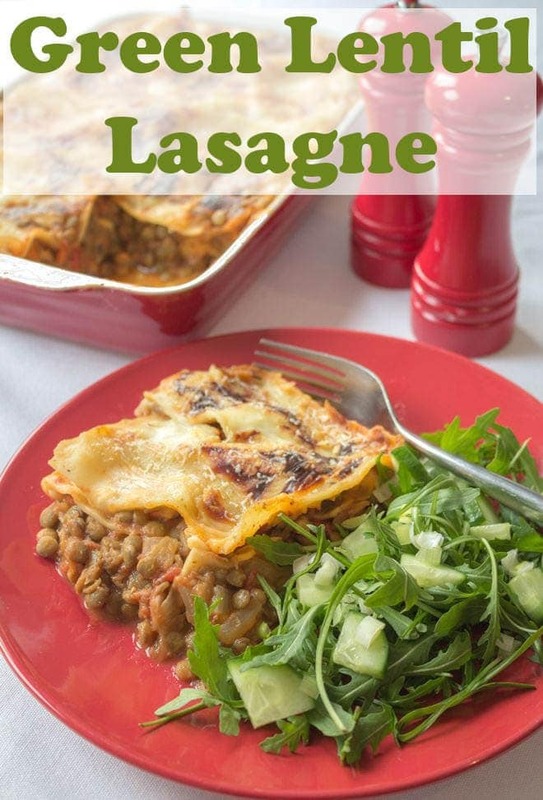 Green lentil lasagne is a delicious meat free vegetarian lentil lasagne recipe. With a mozzarella filling which compliments the nutty flavour of the lentils. And a tasty rich melted cheese bechamel sauce topping. 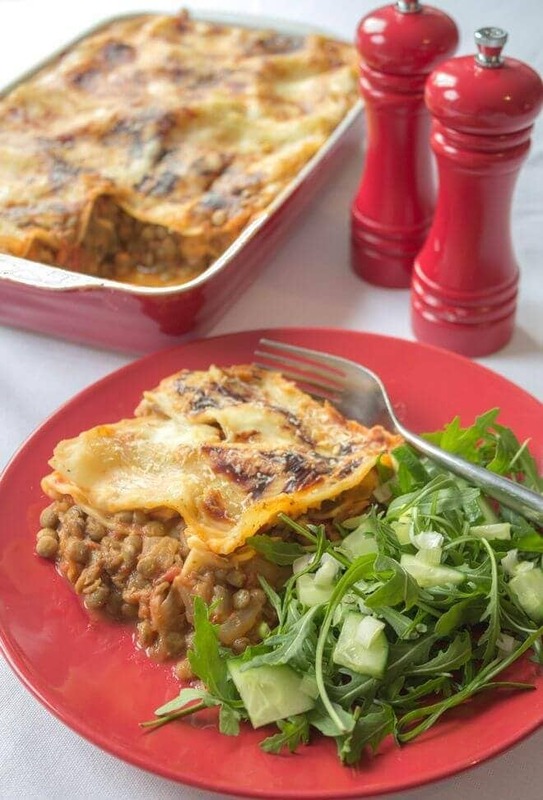 This lentil lasagne is amazing! Lynne and I both love lasagne. We’ll often have it the traditional way with minced beef. Such as in my low-cost healthy lasagne. Or as a vegetarian option like my veggie lasagne recipe. But this vegetarian green lentil lasagne recipe is something completely different. It’s a lentil lasagne recipe that I’ve had in my head and that I wanted to trial for some time. Today I’m adding this to my growing list of vegetarian recipe options. 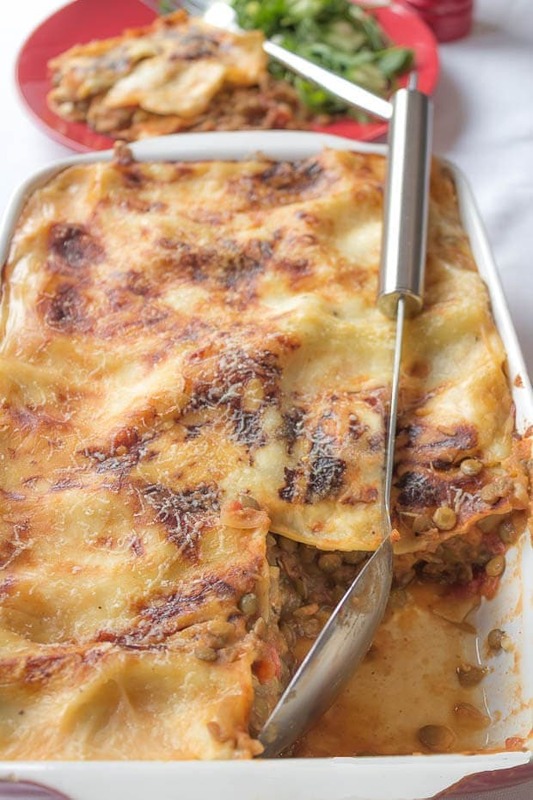 There are only 452 calories in this green lentil lasagne. And I know you’re going to love it. Whether you’re vegetarian or not! The Inspiration For This Green Lentil Lasagne? So I’ve had this green lentil lasagne recipe in my head for some time. Just how exactly did this come about? Well, Lynne and I aren’t strict vegetarians in any way. But we have committed to reducing our red meat intake to as little as once or twice a month. We’re aiming to eat as close as possible to a Mediterranean diet. Which I wrote about within the healthy living section under myths and facts of fad diets. We already choose lean white meats like turkey and chicken and as much fish as we can. People in the Mediterranean also eat more lentil and plant based dishes than we do. As I mentioned Lynne and I love lasagne. We already have a red lentil lasagne recipe that we love. But I couldn’t find a recipe for green lentil lasagne that I liked on the internet. So this is why I came up with this one! The following links and any links in the recipe card below are affiliate links. That means that if you click on it and then buy that product I’ll get a small commission (at no extra cost to you of course). If you do click through then thanks for being a part of Neil’s Healthy Meals! These are the green lentils that I use in the making of this green lentil lasagne. 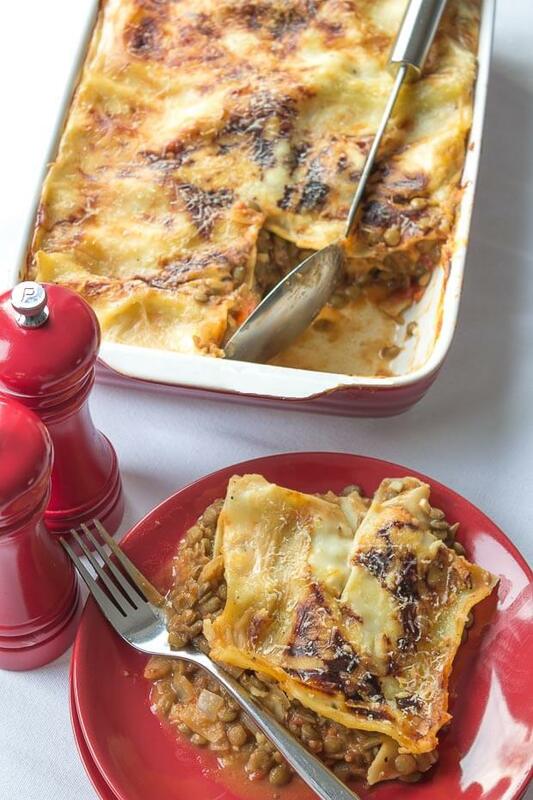 – Make this lentil lasagne in stages following the recipe below. – First make sure you have prepared all the ingredients. – Then make the lasagne filling. – When the lasagne filling is simmering make the cheese sauce. – Then assemble the lasasgne as per instructions. – Cook in the centre of your pre-heated oven watching to make sure the cheese becomes browned but not burnt. See my pictures for how it should look. 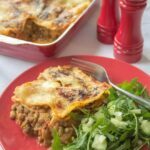 If you enjoyed this green lentil lasagne then how about trying another of my green lentil dishes? Like my Green Lentil Dahl? Anyway, that’s all from me today. I hope you can join me next time for a new Spicy Chicken and Red Pepper Soup recipe! This is a tasty dish to be enjoyed by the whole family. It’s perfect served with a light green salad of rocket, cucumber and celery. You can freeze this green lentil lasagne too. This green lentil lasagne is an extremely tasty, vegetarian family recipe. With delicious melted mozzarella within and a tasty cheese crust on top (both reduced fat) complementing the nutty flavour of the green lentils, this truly is something different. 430 g mozzarella balls cut into 8 slices each. I use the reduced fat ones. 75 g grated cheddar cheese I use reduced fat cheese. Drain the lentils and place them in a saucepan with the hot vegetable stock, turn on the heat, bring to the boil, then turn down the heat and simmer and cook covered, about 25 minutes. Check lentils regularly to ensure they don’t need topped up with more water. You want them to cook to a very soft consistency. In another saucepan, spray the bottom about 5 times with the low calorie cooking oil spray, turn the heat on high, then when the oil begins to bubble a little, turn the heat down to medium and sauté the onion, garlic and celery until soft. Stir the sautéed onion mixture into the cooked lentils, then add the tin of tomatoes, tomato puree, dried herbs and the warm water. Mix well. Simmer the lasagne mixture for about 10 minutes and season to taste. Place the milk in a saucepan with the corn flour. Turn on the heat and allow to simmer, but stir constantly until thickened. Add the grated cheese and stir until all the cheese has melted and a sauce is left. Season to taste. Spoon half of the lasagne filling into an oven proof dish, then top with 8 slices of the mozzarella. Spoon the other half of the lasagne filling over and top with the final 8 slices of the mozzarella. Layer the lasagne sheets on top, pour over the cheese sauce and sprinkle over the freshly grated parmesan over. Cook in oven for about 20 – 22 minutes until the cheese is bubbling and slightly browned. Remove from the oven and allow to cool a little before serving. Serving suggestion – serve with a green salad of rocket, cucumber and celery. I adore lentils and lentil curry happens often in our house – but lentil lasagne – now that’s a first for me – BRILLIANT Neil! I am OBSESSED with lentils, so the idea to use them in lasagna is fantastic. I bet this is so good!